The Rook is a surprisingly impressive piece of fiction, managing to turn a literary device often used to provide back story into an integral part of the story. Myfanwy Thomas wakes one morning in a London park surrounded by bodies wearing latex gloves, somewhat battered and bruised and with no memory of who she is. She does however have detailed notes written for her by her previous self to aide the discovery of her former life. The book is inter-spaced with this narration from her former self which provides an effective break to the story and a clever device to build back-story, with Myfanwy (pronounced "miffany") learning about her past as we do. While she slowly uncovers who she used to be, she also has to pretend she is still that same person to everyone around her and still carry out her role as "Rook" within the ultra-secret organisation she is a part of. 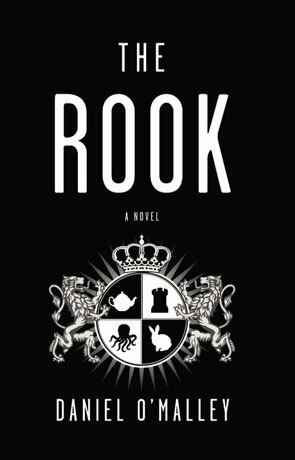 Delivered in a strong and unique voice that has an inventive and clever prose, The Rook is stylish, modern but with an aire of those witty, slightly mad novels from authors such as Tom Sharp, Douglas Adams or more recently Jasper Fforde. At times it almost feels like a young adult novel but I think this is due to the fresh atmosphere, piquant prose and comfortable reading style. That style is warm, welcoming and so easy on the eye that it's almost impossible not to be drawn in. If it's the reading style that draws you in, it's the fantastic characters that keep you there, as you might expect with many having a form of super-power they are somewhat larger than life and yet with enough presence to seem all to real, Myfanwy steals the show though and the relationship with her secretary is just superb. I loved the description of this secret organisation, almost "men in black" but tasked with keeping control of the supernatural rather than the alien. There is enough of a present day description to make it all sound quite plausible too, offset by the clever use of humor that prevents the story from becoming too serious. The situations that Myfanwy is placed in are inventive and often very funny, the way that she deals with them are quite brilliant. The Rook manages to rise above the recent surge of supernatural stories, it's inventive, it's clever and more importantly lot's of fun. Written on 18th January 2013 by Ant.